The tg3 inbox driver version shipped with the ESXi 5.0 Update 2 is 3.123b.v50.1. Disclaimer: The Apple Mac Mini is not officially supported by VMware. Why is this awesome!? Well, for those of you who own an Apple Mac Mini and would like to run ESXi, may recall an additional step is required to create a customized ESXi ISO to include an updated tg3 driver for the networking stack to function in an Apple Mac Mini. Though the steps have been documented here, it is great to see this working right out of the box using the new ESXi 5.0 Update 2 ISO from VMware. In addition to the networking stack functioning properly after installation, it also enables connectivity to an Apple Thunderbolt Ethernet adapter if you happen to have one connected to your Apple Mac Mini! You no longer have to create a custom ESXi ISO for the Thunderbolt Ethernet adapter as mentioned in an earlier article here. Note: This article is only relevant to pre-2012 Apple Mac Mini, if you have a newer Apple Mac Mini 6,2 - Please refer to this article for installation. If you want a tiny form factor for a vSphere home lab, you should definitely consider asking Santa for an Apple Mac Mini this Christmas 😉 Hope everyone has a Happy Holiday and Happy New Years! 5.0 U2 is not avail on VMware’s site. Only allows U1 and 5.1. Can anyone who has this post a link? What’s the max number of nics you can have on each mac mini. Is it just built in gigabit port and thunderbolt to Ethernet. Can it be expanded to 3. That’s correct, only 2. One on-board and if you get a Thunderbolt Ethernet adapter, that’ll give you another. I’ve just installed ESX 5.1 on a macmini 5,3 and everything seem fine but… no network with the integrated NIC! The adapter vmnic0 exists, can be configured for the management network, set a static IP and even says “connected” when an ethernet cable is plugged, but not a single packet goes through. No ping, no DCHP. I’ve checked the vmkernel.log but apart a few warnings nothing peculiar, there is even some lines like “tg3 : link up” and so on. Anyone using this very setup : mini 5,3 and ESX 5.1 (not 5.0 U2)? Do I miss something in the config (I did check the vmware manual and successfully pinged the mac running knoppix to ensure the NIC is not defect). Any idea appreciated. I might try with 5.0 U2. Regards. ESXi 5.1 still needs the tg3 driver update as per 5.0 and 5.0u1. After updating the driver it works great with both inbuilt and thunderbolt adapters. Did you follow the steps here? http://www.virtuallyghetto.com/2012/05/thats-so-cool-running-esxi-5-on-apple.html This works on Mini 5,3 which is what I used to set all this up. Yes I did, i.e. burn a USB stick with ESX 5.1 iso (no included driver nor patch as you mention). Thanks for you offer, I am fine with 5.0 U2 I guess, unless critical features have been added to 5.1. You might advise? How old a MacMini works? Just the 5.x models? 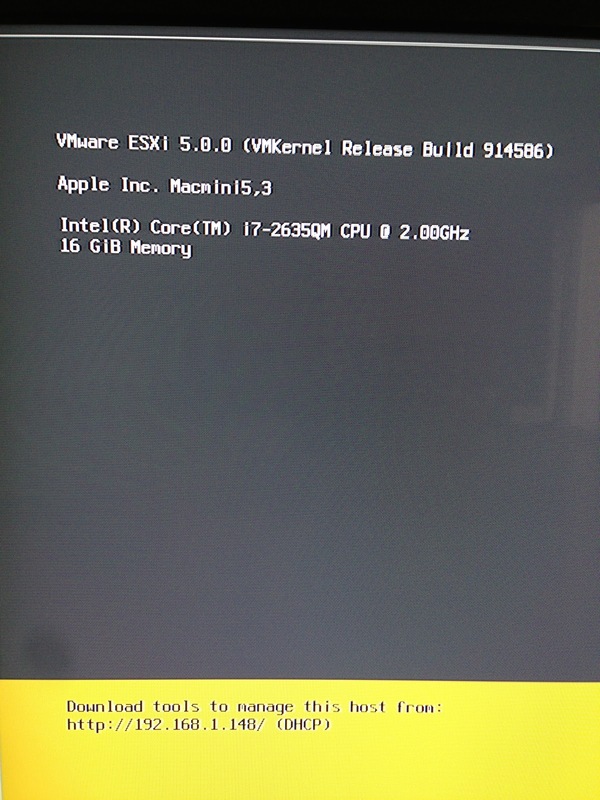 Last year I was able to get esxi booting from USB stick on a Mac Mini 5,1 without any issue. Recently I decided to give it a shot on another Mini, this one a 4,1 (mid 2010) and I can’t get it booting off of USB at all. Any idea if this is because it’s an older mini and something changed after 2010?